Food4Rhino is the Plug-in Community Service by McNeel. Users can find the newest Rhino Plug-ins, Grasshopper Add-ons, Materials, Textures and Backgrounds, Scripts and much more, get in contact with the developers of these applications, and also share their applications. Use the new search tool to filter your selection. There are no fees to use food4Rhino. As we are working on a system so that Rhino and Grasshopper find automatically the last version of any plug-in or add-on, the Remote Control Panel has been discontinued. food4Rhino is in constant development, so we’ll be glad to hear your questions and feedback at 4FQ.RYY3Q4@F3GULnPFFO@. As a developer of Rhino plug-ins, Grasshopper add-ons, Scripts, Materials and Textures or other resources, you can now take advantage of the site's infrastructure and exposure to improve how you share and market your applications, get valuable feedback from users and manage your updates and new builds easily. This section lets you add some media files. Allowed media links: youtube, vimeo, p3d.in, mcneel.github.io,www.shapediver.com. Videos URL format must be "embed". Click on Share then copy the Embed link, paste only the link in between quotation marks. For Vimeo, link should look like https://player.vimeo.com/video/58212839. The “Files” section refers to your releases (installers). Choose the platform (Rhino for Mac, Rhino for Windows or Grasshopper) and the type of installer (Eval, Free, Open Source). 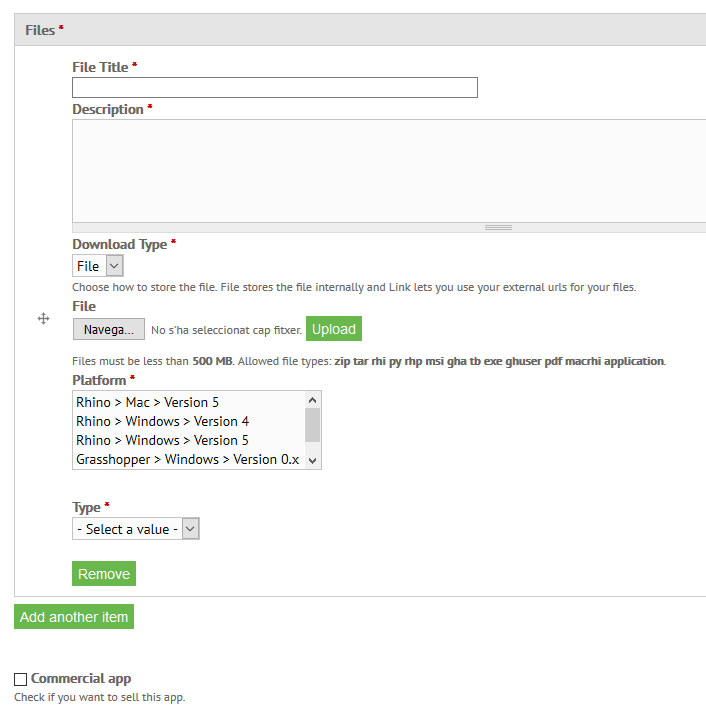 You can upload a file (up to 500Mb) or put an external link directly to a file. 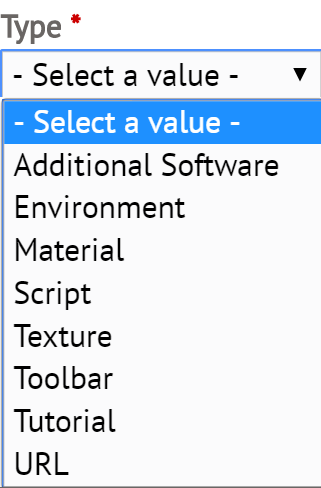 Only supported formats below accepted, except if the link is a folder at Dropbox or AppBox. Rhino Installer Engine .rhi file (suggested): This allows Rhino to keep track of updates while, at the same time, deliver a simple-to-use release packaging method. The .rhi installer is a Rhino 5-only feature. See: http://wiki.mcneel.com/developer/rhinoinstallerengine/overview for details. Windows Installer package .msi file (suggested): This has the broader installation abilities, both at machine-level and at local user-level. See http://msdn.microsoft.com/en-us/library/cc185688 for more information. Supported: A simple .zip file as delivery method for both Rhinoceros and Grasshopper plug-ins; a single .rhp file; a single .gha or .ghuser file for Grasshopper components; several picture formats for textures and backgrounds. These will be unpacked as necessary and put in a suitable user-level folder on the target machine. Supported: Specially crafted .exe installers. .exe installers must register themselves in the Windows Uninstall registry hive during install. Specifically: the food4Rhino Remote records the list of installed programs before running your .exe. Just after the .exe has run, it compares the new list of installed programs with the old one, and spots your program. Then it stores the uninstallation instructions. The full registry path being watched is LOCAL_MACHINE\SOFTWARE\Microsoft\Windows\CurrentVersion\Uninstall. Deprecated. .exe files that do not execute the operation described above. Any other file with other extensions is deprecated. You can choose the order in which your files will be shown. If you want to sell your app, select “Commercial app”, define the Price and currency, and add the direct link where users can buy it. If you don’t have your own system to sell, we suggest to take a look at Fast Spring (https://www.fastspring.com/), Digital River (http://www.digitalriver.com/), or other similar online software resellers. If you want to sell your resource, select “I want to sell this resource”, define the Price and currency, and add the direct link where users can buy it. When you choose the icon and the text for your project and release, keep in mind that a nice looking icon and comprehensive explanation will greatly improve the final user experience. We encourage every icon developer to have a custom drawn icon, and not a screenshot, to explain their project and make it memorable. The color choice is yours, and you can use tones that will remind users of your corporate look or something specific for your project. Do not use a blank icon. Also, write a short introductory phrase at the beginning of the overview. Start with the name of your plug-in, then use a verb, then expand on the usage of your plug-in and explain what it means. You could write something like this: “The Ufo plug-in detects and monitors paranormal activity that is happening immediately around you while you are using Rhino's 3D modeling abilities”. User privacy, trust and security is very important for us and key for the success of food4Rhino. Send us the “Data Disclosure Agreement” (http://www.food4rhino.com/legal/food4rhino-transfer-of-data-statement.docx) by e-mail to 4FQ.RYY3Q4@F3GULnPFFO@, by fax to +34 933195833 or by post to McNeel Europe SL – Roger de Flor 32-24 bajos – 08018 Barcelona – Spain. Once we approve the documentation, you will be able to check all e-mails of users that have downloaded your contents, and the total number of downloads, on your personal area. McNeel Europe provides a translation and localization service for third-party developers We offer a complete localization service, including software applications, web sites, marketing material, documentation, and more. Contact us for a free quote.